A few days ago, I was surfing the web. 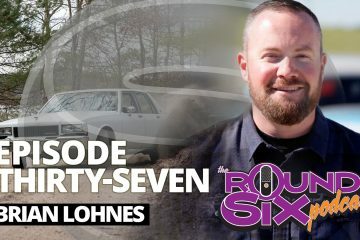 I saw that there are plans by Mark Wahlberg and Peter Berg to make a movie version of the iconic 1970’s TV show, The Six Million Dollar Man. Generally, I’m not a fan of Hollywood remakes, so I wasn’t exactly thrilled about the news. This time, maybe due to inflation, it’s set to be called The Six BILLION Dollar Man. And I assume that Mark Wahlberg wants to play the lead role. For those who aren’t familiar with the 1970’s TV show, it’s based on a former astronaut named Steve Austin, who after a horrific test plane crash, loses both legs, his right arm, and his left eye. His life is saved by doctors, who fit him with the latest experimental bionic components. With the new gear, Steve Austin has almost super-human power and becomes a secret agent for the OSI (Office of Special Intelligence). Each week, the show opened with the actual NASA footage of the aircraft crash that critically injures Colonel Austin. 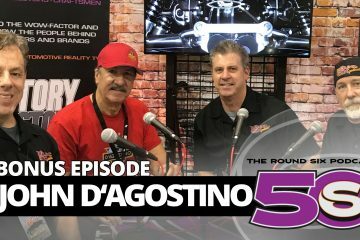 Every young fan of the show could quote the words that played out during beginning of each show. As a 10 year old kid, I would never have guessed that my paths would later cross with the guy who was actually piloting the aircraft in that famous NASA video. That’s right. 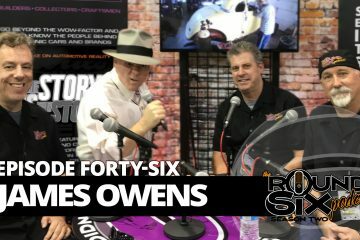 I worked with the REAL Six Million Dollar Man, Bruce Peterson. After a nearly 10 year stint in the U.S. Air Force, I took a job with the Northrop Corporation as a Test and Checkout technician on the B-2 Stealth Bomber Program. On occasion, I would see the guy who was the head of the Safety Department. 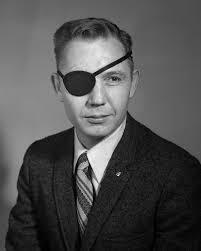 A quiet gray-haired man with an eye patch, about 60 years old. I was present during a few safety investigations with the man, and I found him to be very sharp and on-point. He was not a guy you could B.S. It wasn’t until later that someone mentioned to me that this unassuming guy was actually a former NASA test pilot. The story went on that this guy was also the pilot who was in the Six Million Dollar Man footage that I watched every Saturday night as a kid. I had always assumed that NOBODY could have survived that horrific crash, so I was automatically skeptical. I had to find out more about this guy. As it turns out, the legend was correct. He WAS the guy in the video! Bruce Peterson was born on May 23, 1933 in Washburn, North Dakota. After graduating from UCLA, he entered the Marine Corps as a Second Lieutenant. 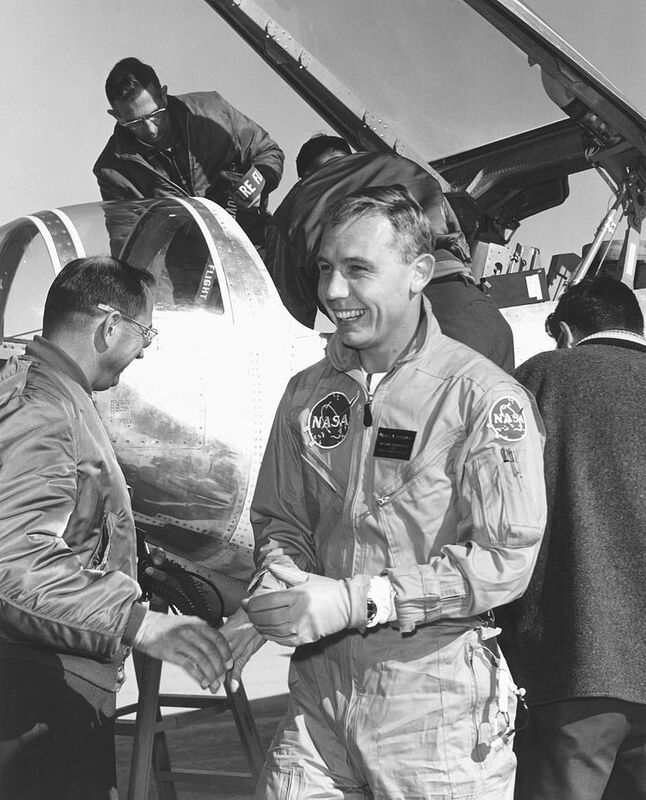 He joined NASA in 1960 as an Engineer, and graduated from the U.S. Air Force Test Pilot School in 1962. His first assignment was with the Rogallo Paraglider Research Vehicle Program. As a NASA research pilot, he flew a wide variety of airplanes. These included the F5D-1, F-100, F-104, F-111A, B-52, and the NT-33A Variable Stability Trainer. He was also a part of the fascinating “Lifting Body” research programs that tested various fuselage shapes in order to gather valuable data for space re-entry research, and ultimately, the Space Shuttle. These high-risk programs involved jettisoning non-powered and inherently unstable aircraft from a B-52, where they would glide down and land on the Edwards Air Force Base lake bed. The short three-minute flights would gather data on glide ratios, entry speeds, angle of attack profiles, and lateral stability. As it was essentially a glider, you only had one shot to land it. 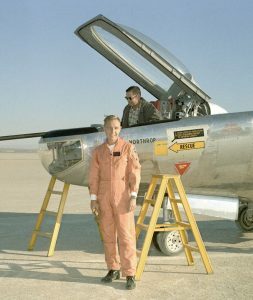 He made a total of 17 lifting body flights, but it was on his last one where Bruce Peterson had his famous brush with death. On May 10, 1967, Peterson was piloting the Northrop M2-F2 lifting body. The release from the B-52 mother ship went flawlessly. 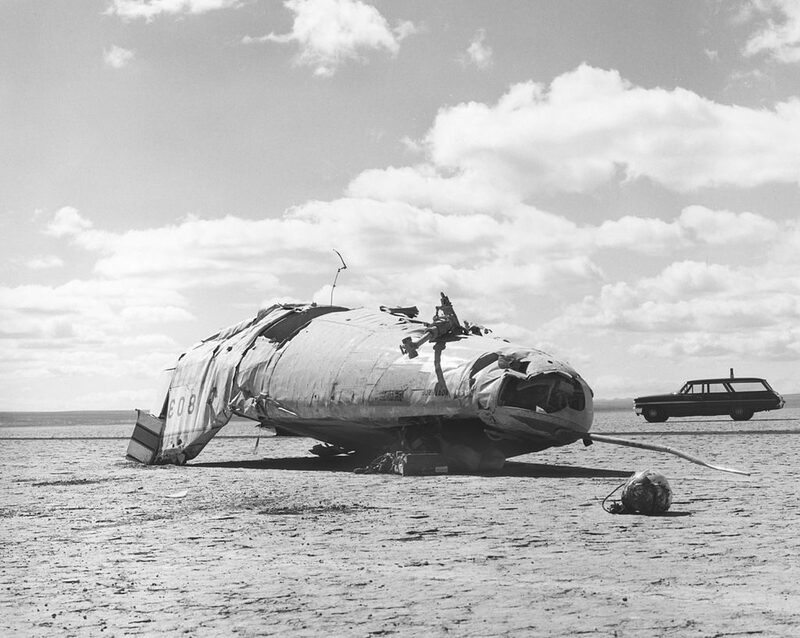 During the landing approach, Peterson’s M2-F2 suffered a pilot induced oscillation (PIO) as it neared the lake bed. The design of the wings of the M2-F2 (essentially the rear portion of the aircraft) produced decent lift characteristics but very poor roll characteristics, making the landing descent harrowing for the pilot. This characteristic creates a condition known as a “Dutch Roll” where the aircraft rocks from side to side. The M2-F2 rolled violently from side to side on approach as he tried to bring it under control. Peterson recovered the aircraft, but it carried it off course from it’s intended landing zone. 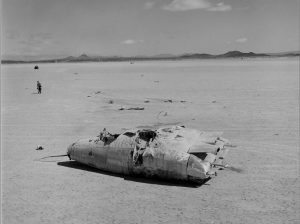 He was now headed towards an unmarked area of the lake bed where it was nearly impossible to estimate his height over the ground, because this area did not have the guidance markers that the planned landing spot had. Peterson, an excellent pilot, quickly and instinctively raised the nose, damping out the lateral motions. A rescue helicopter appeared in front of the M2-F2, momentarily distracting him, but was quickly called cleared off by Peterson’s chase pilot. Coming in hot and dangerously low, Peterson fired the landing rockets to provide additional lift and the M2-F2 started to flare. Peterson initiated the landing gear, which needed only one-and-a-half seconds to deploy from up-and-locked to down-and-locked, but time had run out. The gear did not have time to fully lock, and the M2-F2 hit the lakebed at nearly 250 mph. The craft began to somersault violently, tumbling across the lakebed. It bounced, tumbled and rolled over six times before finally coming to rest. 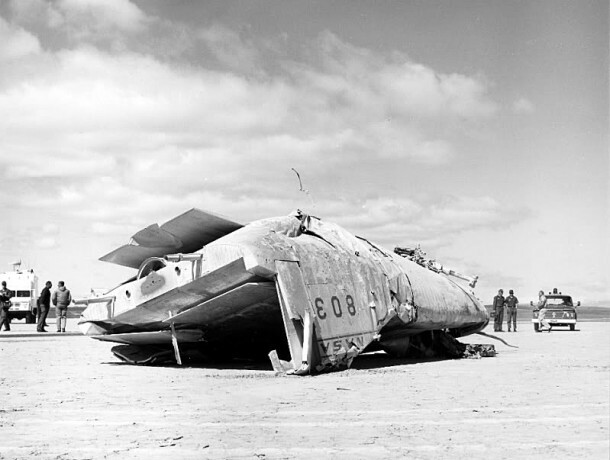 It was upside down, its canopy crushed, the main gear sheared, and right vertical fin torn off. By some miracle, Peterson was still alive. He was pulled from the wreckage and rushed to the Edwards AFB hospital for emergency surgery. Bruce was then flown to March Air Force Base due to their better medical facilities. Several days later, he was moved to UCLA’s University Hospital. He had suffered a fractured skull, multiple broken teeth, had broken bones in his hand, plus had a huge portion of his forehead scraped off. Peterson was permanently scarred by the crash. He recovered, but lost vision in his right eye due to a secondary staph infection while at the hospital. He also developed hepatitis and became allergic to penicillin while undergoing skin grafts and reconstructive surgery to build a new eyebrow and eyelid. The recovery was long and painful but Bruce Peterson was not a quitter. After recovery, he was granted a waiver to fly, but with a co-pilot. He continued his Marine Reserve flying duties in helicopters and fixed-wing aircraft until 1971. During his flying career, he logged more than 6,000 hours in nearly 70 types of aircraft. Peterson continued at NASA as research project engineer until his retirement in 1981. He then worked for the Northrop Corporation from 1982 until he retired in 1994. During that time, he worked in the B-2 Advanced Systems Division as the Manager of System Safety and Human Factors. Bruce Peterson passed away on May 1st, 2006, at 72 years of age in Laguna Niguel, California. He was laid to rest at Joshua Memorial Park in Lancaster. This was a Tv Show From The Early 70s & Now WE are in The Now!! Instead of dumping the M2-F2’s remains to a scrap yard, NASA returned them to Northrop’s Hawthorne facility. Technicians placed the battered lifting body in a jig to check the alignment points, removing the outer skin and large portions of the secondary structure. The inspection took 60 days. After a three-year-long redesign and rebuilding effort, NASA announced that rebuilt M2-F2 would return to service as the M2-F3. 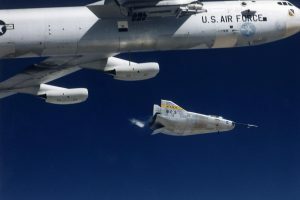 The NASA Flight Research Center engineers worked with Ames Research Center and the Air Force in redesigning the vehicle with a center fin to provide greater stability. 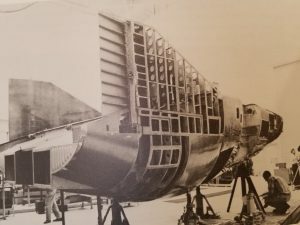 While the M2-F3 was still demanding to fly, the center fin eliminated the high risk of pilot induced oscillation (PIO) that was characteristic of the M2-F2. The M2-F3 flew it’s first flight in 1970, and was retired in 1972. 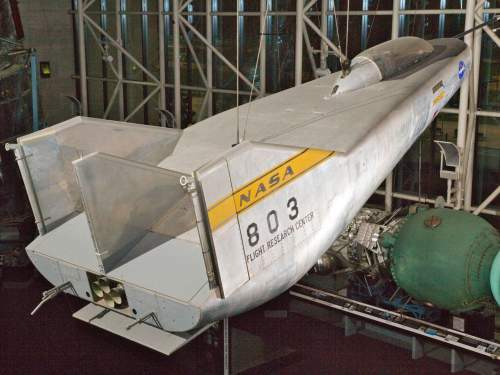 NASA donated the M2-F3 vehicle to the Smithsonian Institute in December 1973. It hangs today in the Air and Space Museum’s Space Galley along with the first X-15, which was it’s hangar mate at NASA from 1965 to 1969. We owe a huge debt of gratitude to the brave test pilots and aircraft designers who paved the way for us to enjoy safe air travel. As far as having their accomplishments cheapened out by high paid actors in mega budget movies loaded with lots of unrealistic special effects? I’ll pass, thank you. I don’t need Hollywood to remind me of how much of a badass Bruce Peterson was. All images within this document were sourced from existing internet sites. Please support those sites by visiting them for additional information on this subject.